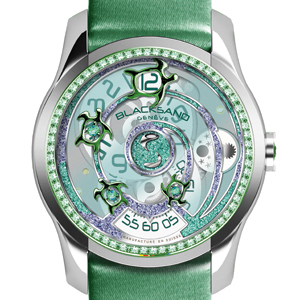 Blacksand launches its Continuity ladies’ collection and presents the Sea Turtle and Koala models. These numbered models issued in exclusive series of 8 watches per version eloquently prove that sophistication and responsibility can go hand in hand. The automatic Blacksand 1999 movement – named after the year the founder’s daughter was born – beats to the heart of this magnificent representation and endows time with a new dimension. This simple and ingenious mechanism offers a wealth of aesthetic freedom and a means of telling the time in a fanciful, elegant manner. The calibre drives an original jumping-hour display at 12 o’clock and a running minutes disc at 6 o’clock. 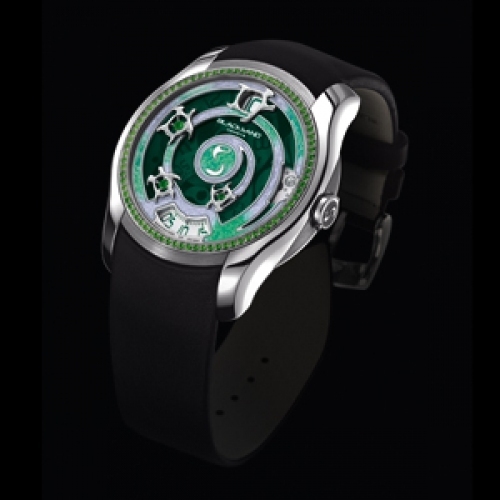 The distinctive aura of the Sea Turtle Emerald also lies in its elegantly staged dial featuring a clever metal cut-out design and subtly integrated tsavorites, emeralds and precious gemstone powder. A creation for elegant and modern women, firmly rooted in the nobility of legitimate causes.